Hanaeleh is a non-profit organization dedicated to the welfare of horses. We rescue neglected, homeless and/or abused horses that would otherwise be sold to slaughterhouses. We promote horse advocacy and manage a social network for all who share an interest in horses–wild and domestic. 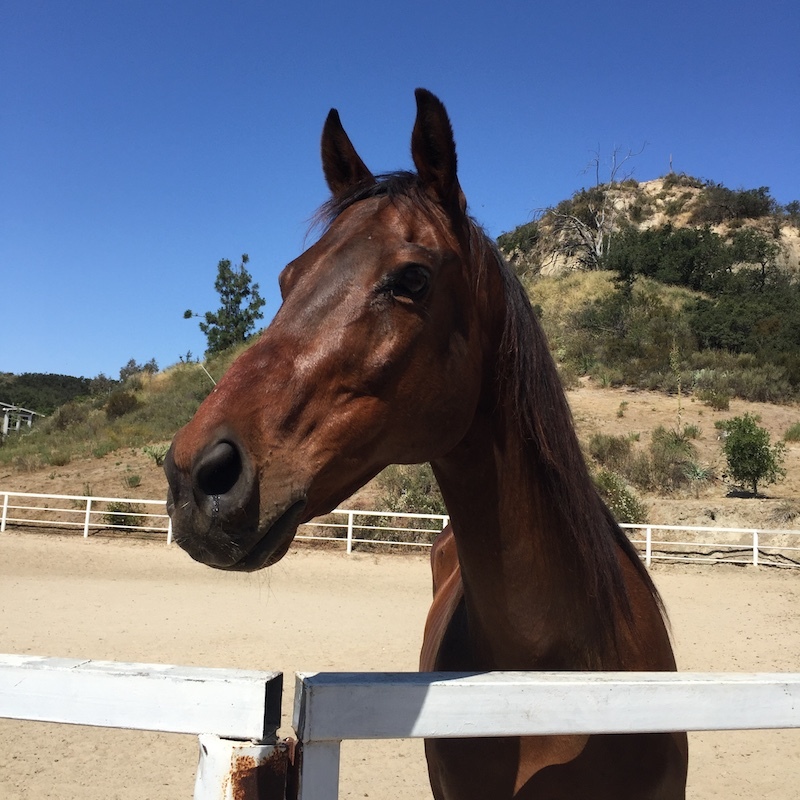 Hanaeleh was created in 2004 after its founder, Elizabeth Zarkos, purchased Cleo, an untrained Arabian horse, from a feedlot two days before the horse was scheduled to be shipped to the slaughterhouse. This purchase started the realization that horse slaughter was still alive–at the time of Cleo’s purchase, 11 slaughterhouses operated in the United States. Hanaeleh (pronounced Hah-nah-lee) is named after the dragon’s home in the song “Puff the Magic Dragon.” It is not Hawaiian, and its spelling comes from an Old English pronunciation. While it may not be the easiest to spell, Hanaeleh’s purpose is the same as the place in the song–a safe haven away from the evils of the world. At Hanaeleh, horses can be rehabilitated both mentally and physically so they can find new lives with people who love them. Hanaeleh believes that every single horse, no matter the age, breed, training, or use has inherent individual value. The welfare of all horses is our primary concern. Horses are companion animals and should be given the same individual rights and level of care that is commonly given to dogs and cats that live as companion animals. Horses are intelligent, social creatures who need mental stimulation, toys, exercise, environmental activity and social interaction. It is the responsibility of humans to care for the needs of domesticated horses. It is in the best interest of all horses to be in a paddock or a large stall, go barefoot, be exercised daily and be treated for illness by a veterinarian. The practice of horse slaughter should be made illegal in the United States. **The practice of keeping mares and breeding foals for the purpose of creating Pregnant Mare Urine (PMU) is abhorrent and should be stopped. To rescue horses from potentially being sold to a slaughterhouse, from a situation of abandonment, from situations when they can no longer be kept by their owners, and from situations of neglect. To support and educate network members, veterinarians, humane societies, breeders, and the public with information about horse slaughter, PMU mares, horse adoption and horse rescue. To promote an interest in horse advocacy and horses in general. To provide temporary foster care for rescued horses until suitable, loving permanent homes can be found. To form social interactions with others who share an interest in horses. To form a coalition joining all other horse rescues to further pursue common goals. Hanaeleh shall remain independent of any other group or organization. Hanaeleh respects the privacy of its members. Directories will not be distributed to the public or any organization. Any Hanaeleh publicity is to serve in the best interest of horses, and reinforce the image of horses as companion animals. Due to the nature of its cause, Hanaeleh may choose to associate itself with a political affiliation. This affiliation must be approved by the President. Individual members may also choose to influence legislation but may not do so in the name of Hanaeleh. No more than 25% of its operating budget shall be used to influence legislation. Funds raised by, and donations to, Hanaeleh will be held in a General Fund and distributed within the organization as the President and officers see fit. All Hanaeleh issues and decisions must be approved by the President. Involvement in Hanaeleh activities and events is strictly on a volunteer basis. Information and advice for veterinarians, horse owners, trainers, breeders, and the public shall be given in a friendly, helpful, non-harassing manner.